I've recently acquired my first Windows 8 tablet. While I've been working with Windows 8 since the first public beta became available, I've only been able to experience it through the traditional keyboard and mouse interface. When I began toying with the Asus Vivo Tab RT, I was expecting the system handle much the same. Boy was I wrong. Using the touch interface in Windows 8 is far from intuitive. Much of the UI is hidden with no obvious way to execute the commands necessary for basic functions like managing tiles or sorting mail. For nearly every basic action, I've had to look up how to perform the touch-based equivalent. I'm a staunch supporter of Windows and Windows 8 has really grown on me. Using the systems prior to it make me feel like something is missing, like I'm only using half the OS. But the past few days have been nothing but lesson after lesson as though I'm learning it for the first time. One thing I've learned and am constantly applying is swiping. If ever there were an OS for villains of youthful, aspiring adventurers, then Windows 8 is it. Swipe in from the right to being in the Charms Bar which contains Search, Settings, and many useful abilities. Swipe in from the left to change recently opened applications. Swipe down on any selected item to bring up another set of options. For example, if you want to sort your email into their respective folders, you'll need to select your messages and swipe up to bring up the toolbar which allows you to move the messages to another folder. In an OS focused on touch, it makes more sense to me to simply allow users to select the message by tapping it and then dragging it where they want it to go. But who am I to say? I'm certainly not a developer. This same practice applies to the "Metro" (Sorry, Microsoft. We're not calling it anything else.) tiles. Tapping and holding a tile should bring up the options for resizing and then dragging should move. Instead, you swipe down for the options to resize. Moving them is even more arduous as users must tap and hold the tile and then very slowly drag it down and then move to where you want it. These are small complaints overall, but complaints all the same. It's little wonder that Microsoft's new system has been received so poorly. Until I got this tablet, I didn't realize how truly little I knew about controlling Windows 8. One shortcoming I was aware of when I bought a Windows RT tablet was the inability to install x86 based (desktop) applications. Through an overly convoluted plan, I was set on creating regular local copies of my SkyDrive documents on a removable memory card for offline access. While I still haven't completely nixed those plans, I found a terrific resource that can map SkyDrive as a network drive for access through the file manager. A huge thanks to Shawn Keene for posting the guide on this. I still very much enjoy Windows 8 and am exciting to keep learning all the intricate nuances that make it tick. But I have a new level of respect for those complaints against it. Note: This was typed using the touch interface alone within Windows RT. 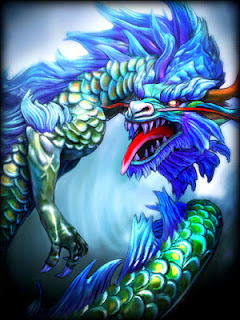 My preview of Smite god, Ao Kuang, is up at Gaming Climax! 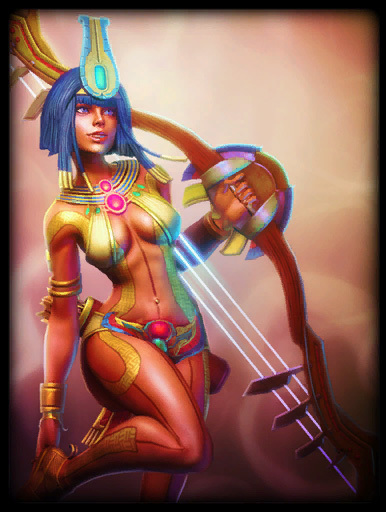 My preview of Neith is up at Gaming Climax! Day two of E3 was kind of slow for me as I'm not a huge fan of Nintendo for multiple reasons. Don't get me wrong, I certainly don't hate Nintendo. It's just that their lackluster software line-up and constant cookie cutter sequels of their franchises have worn thin. I just can't get excited about playing Mario 25 on a next-gen console using current-gen technology. However, there is one title that Nintendo has acquired that demands my attention. 2009 was a low point in gaming for me. I was getting burned out on the over abundance of first person shooters that had saturated the market. I wasn't having fun playing games anymore. Just when I was about to throw in the towel, I picked up a title that turned all of that around. Bayonetta was an exuberant, shameless, punishing treat of a game. It was ridiculous and over-the-top without shoving it down my throat. To this day, it remains in my top 10 games of all time. A sequel to my personal favorite action title is an exciting prospect. What's less than exciting is that it will be a Wii U exclusive. While I give thanks to Nintendo for saving the series by partnering with developer Platinum Games, I'm frustrated that if I want to play, I have to buy a console. If I were to justify buying a console for one game, I'd be filled with remorse as it collected dust in between play sessions. That's exactly what happened with the Wii at my home and I can guarantee the Wii U would suffer the same fate. It will be some time until Bayonetta 2 is released in 2014. Maybe the Wii U will have a better library to support it. Or maybe...just maybe...after Nintendo has taken their fill of the initial sales, we'll see a port to PC. One can only hope. 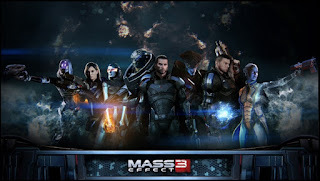 Since Play Estate is no longer operational, I'll be posting my reviews of Mass Effect 3 here. Mass Effect 3 took a bold new step with the addition of multiplayer. 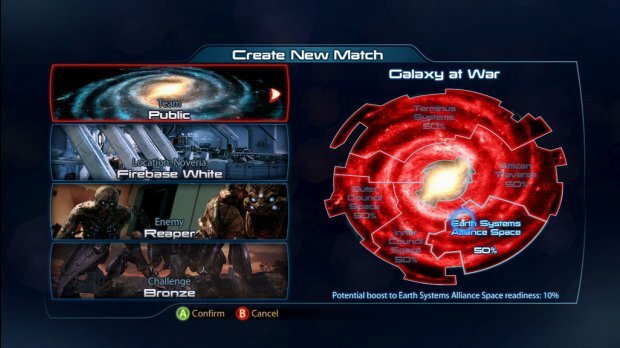 Galaxy at War pits a team of four against eight brutal waves of Cerberus agents, Geth, or Reapers. Players take on the roles of Mass Effect’s classes and must survive 11 waves while completing objectives. Surviving grants credits which can be spent on new characters and gear. If that’s not enough to convince you, here’s five reasons why you should try Galaxy at War. While Mass Effect 3 was heralded as a commercial and critical success, the ending left the gaming community divided. Many, including myself, felt it was generic and was not tailored to the decisions made across three games. On top of that, the endings to this epic trilogy were incredibly short and left much to the player’s imagination as to what happened afterwards. On the other side of the fence were those that said it was within developer BioWare’s right to end the series as they saw fit. This is an incredibly valid point, but in an industry where fans decide whether a studio lives and dies, some sort of middle ground needed to be reached. 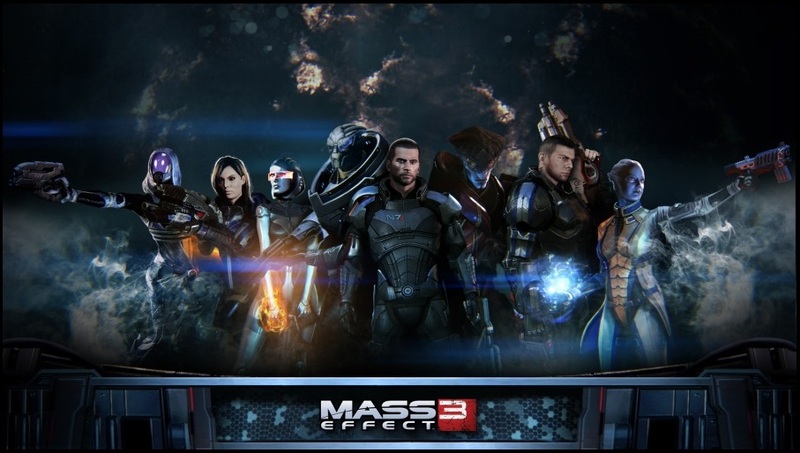 On June 26th, BioWare did just that and released the Mass Effect 3: Extended Cut. It’s been a long ride. Since its initial release in 2007, Mass Effect has captivated millions with its rich and imaginative world. From chasing a rogue agent to uncovering a plan to annihilate nearly every living thing in the galaxy, our future would be a grim one if not for the exploits of one Commander Shepard. Mass Effect 3 marks the end of what can only be considered one of gaming’s greatest trilogies. With so much anticipation, can Mass Effect 3 live up to its own legend? With only a day in, E3 2013 is proving 2013 is going to be a tremendous year for gaming. With two new consoles, exciting additions to beloved franchises, and tantalizing new IPs, it's like Christmas come early. While there's certainly a lot of content to cover, I'll be sticking to what has excited me the most thus far. MercurySteam and Konami blew me away with their 3D reboot of the Castlevania series. Following the story of one of the first Belmonts and his radical transformation with one of the best twists in a game, this has been a long anticipated sequel. For the first time, we get to play as the fabled count. What other secrets will be uncovered? I've created a new intro video which will now play before all future videos. Let me know what you think! My review of action MMO, Elsword is up at GamingClimax.com!